Raise your hand if you want more space in your kitchen. 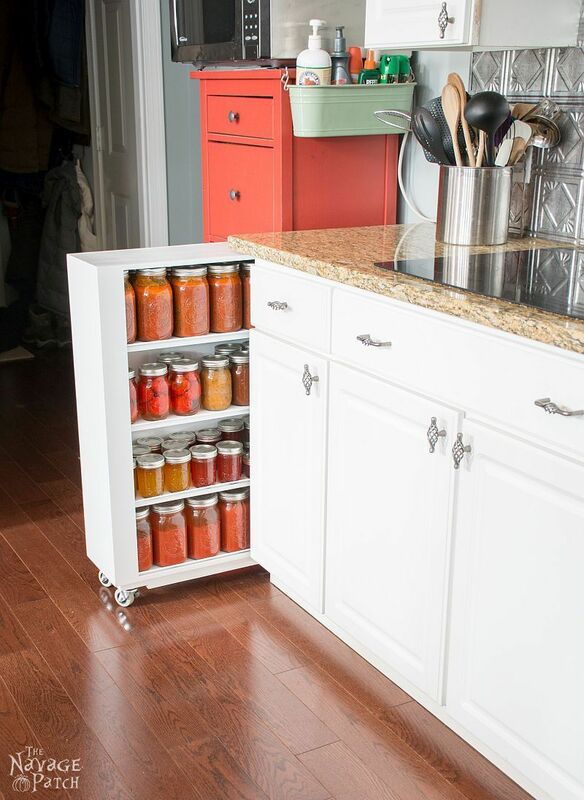 Honestly, I have yet to meet someone who said, “I have enough space in the kitchen.” You always need some extra storage, or extra working space, or something else. There is no such thing as enough kitchen space. And while some of us are blessed with a spacious kitchen, others live in tiny apartments, with tiny kitchens. But I want to tell you something straight: you can make every kitchen work. In that regard, I want to share some ideas for utilizing your kitchen space. 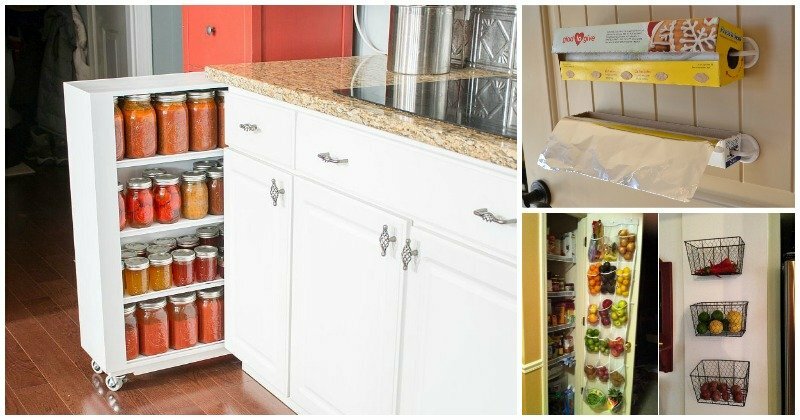 There are some tips and tricks you can use to get more storage and working space in the kitchen. So, let’s go! 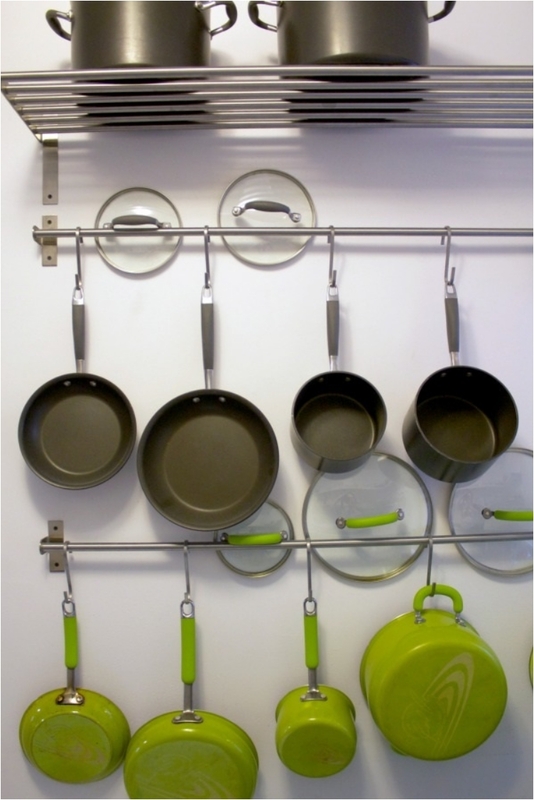 The wall is one of the first places you can use for adding extra space in the kitchen. 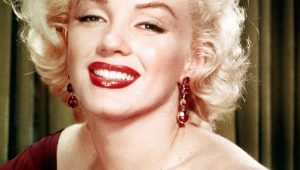 I know that some of us prefer minimalism and clean space. But that doesn’t mean that extra shelves on the walls will make them look cluttered. 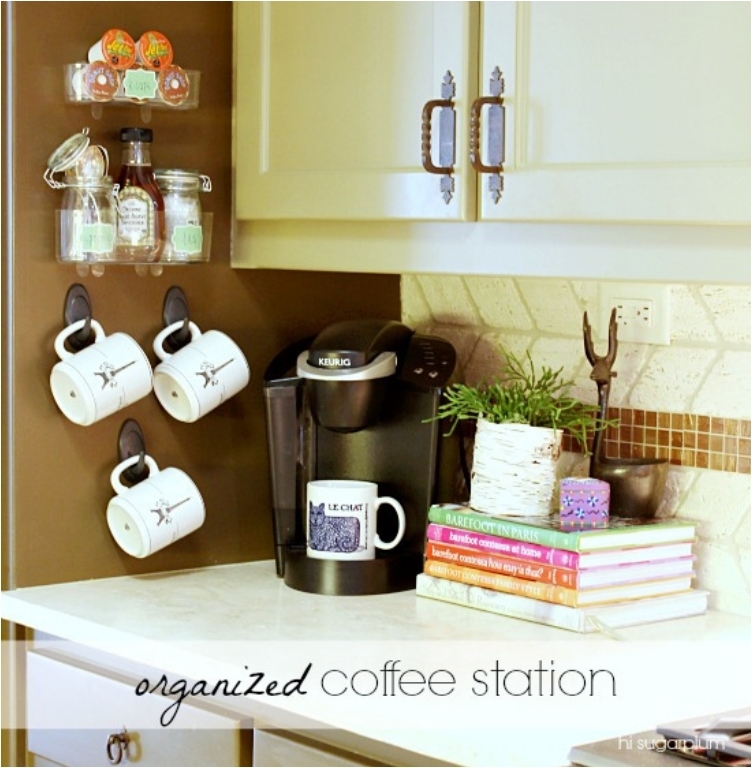 To be honest, your kitchen might be more organized than ever. 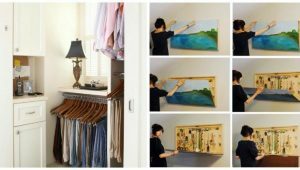 The cabinet doors are the next trick you can use. They are just so versatile, you can utilize them in a number of ways. For starters, let’s try something simple. Again, we are using the wall. 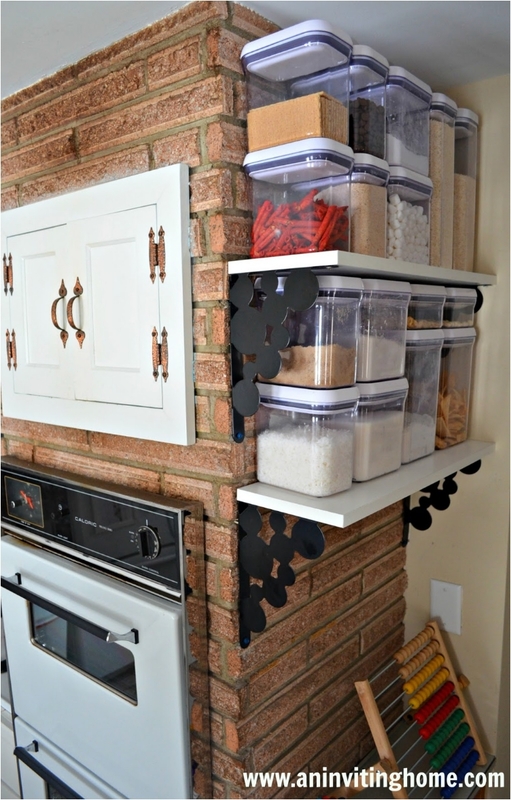 But this time, we get some storage containers to make the wall even more organized. 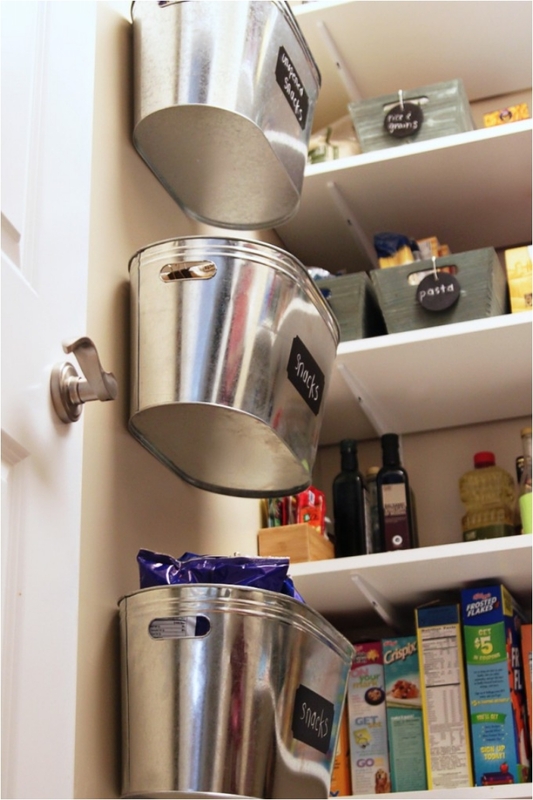 You can use these containers for spices or for vegetables and fruits. The sky is the limit once you set up the storage wall. Personally, I don’t drink tea often. I don’t drink coffee either. But when it comes to tea, I pride myself on having several different tea bags at my disposal at all times—that’s just being a good host. 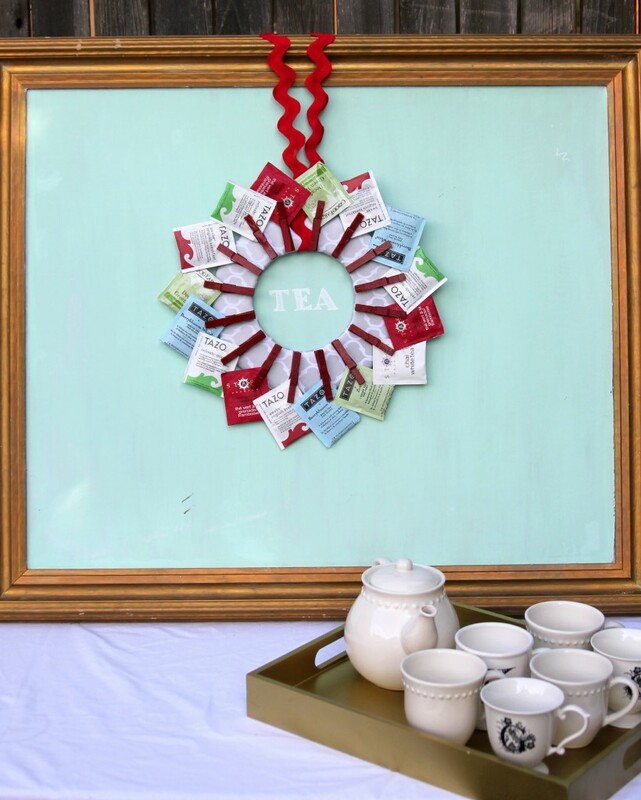 And this decorative idea can help you store your teabags in a more unique way. Whether you drink tea or not, have some tea bags within arm’s reach. One of the most important lessons you need to learn in a tiny kitchen (or a tiny room, for that matter) is TAKE CARE OF THE DEAD SPACE. Yes, I wrote that in caps. But you have to understand—every dead space you leave untouched is wasted space. And the space between the fridge and the wall is definitely something we generally ignore. But those who utilize it have much more storage space. This is not just a practical trick. It’s also a very smart way to make your kitchen look cleaner. To be fair, nobody wants to see your trash cabinet. Try to hide it. This is just one of the ways you can do that. 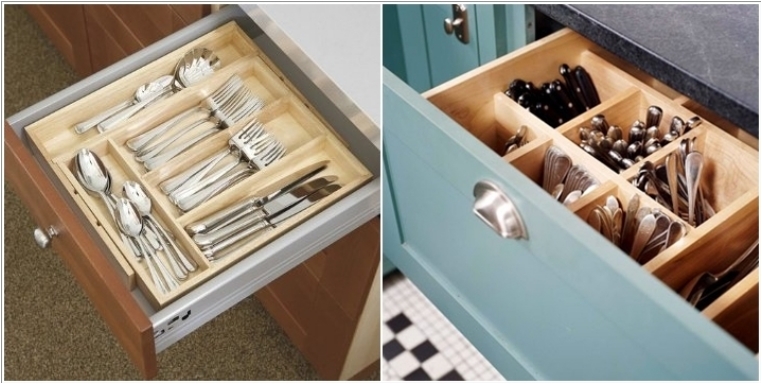 Ask anyone who has a tiny kitchen, and he will tell you that storing silverware is probably the biggest challenge. We all try to find different ways to store our silverware. Today, I have an idea for that. I’ve solved this challenge in a different way—I have fewer pots and pans. But I do understand that some people want to have at least four or five different pots and pans. And having so many can be challenging, especially when it comes to storage. So, once again, use the wall for storage. Some of us keep magnets from our travels on the fridge. But why not use the space in a more practical way? 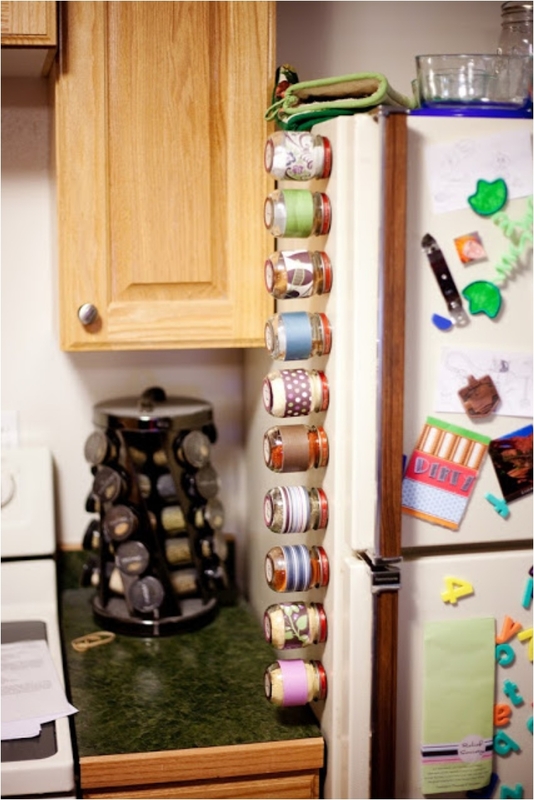 For example, why just magnets from trips, when you can have magnets for spice jars? No, it doesn’t look as good as the magnets from your travels. But hey, if you want to cook, you need spices! 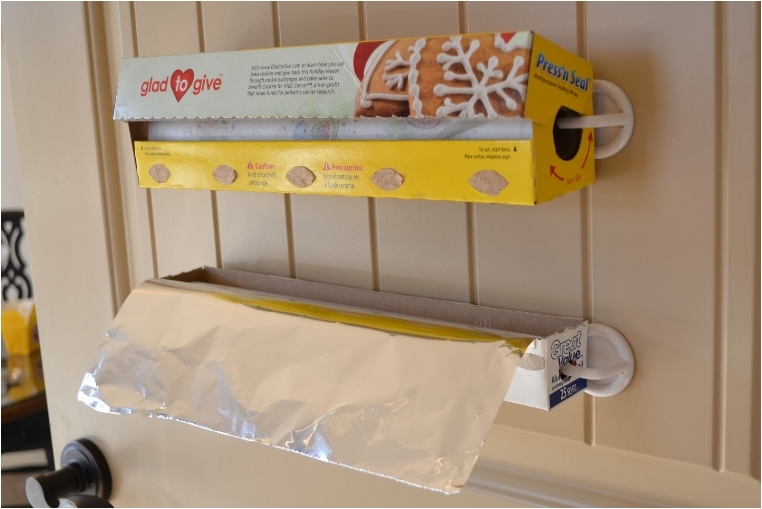 Storing foils is usually easy, but I want to give you another way to do it. I know lots of people who store their foils in the cabinet. But that’s just not practical—you need them within arm’s reach. Yes, this trick will require a little bit of handiwork. But believe me, once you finish it, you’ll be surprised how much larger your kitchen will feel. The corner is another dead space you can and should utilize. If your cabinets allow it, don’t wait one single minute. 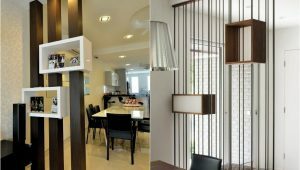 When you have floating cabinets, you can definitely use the space underneath them. 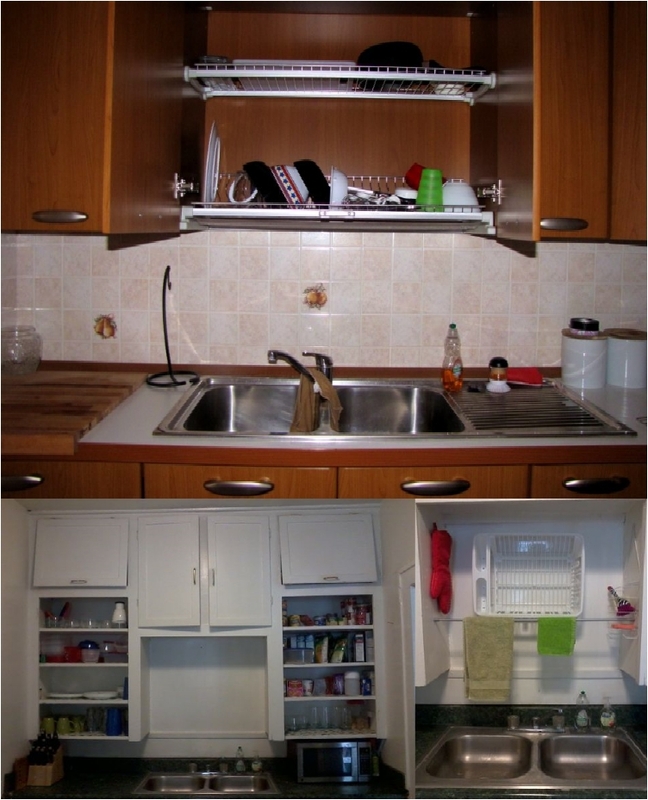 Of course, if your cabinets aren’t floating, that’s a different discussion, as you’ve already used the space. 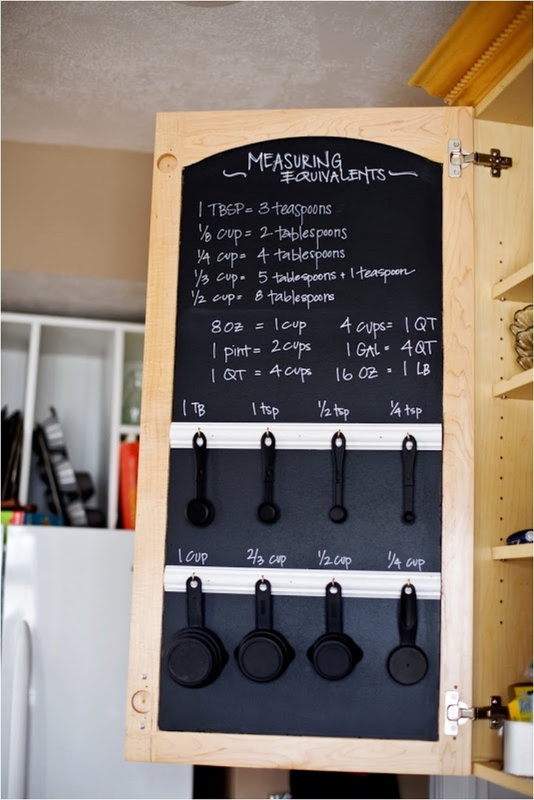 Remember when you were little, and you were in kindergarten—we had these pegboards for hanging pictures and drawings? It was just so easy. Just go and pin the drawing on it. 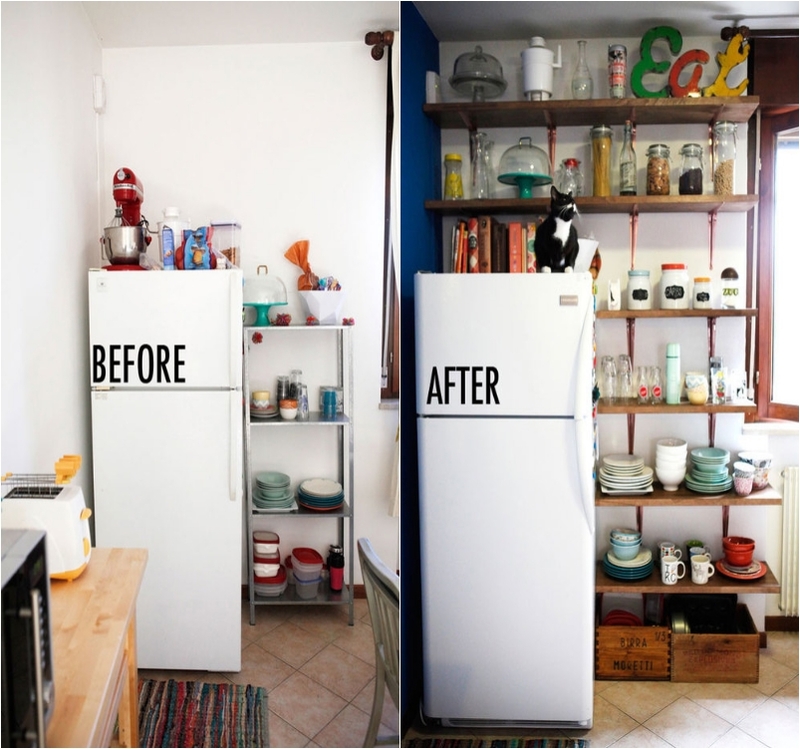 Now you can use the same trick for adding some extra space in the kitchen. It will come in handy for all your utensils. 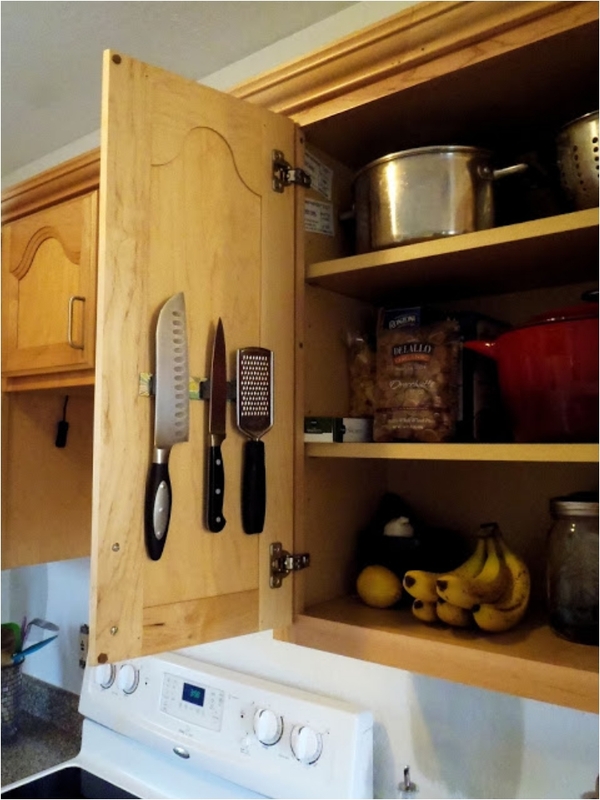 Don’t think of this as just a practical way to store your knives. It’s also a safe and secure way. 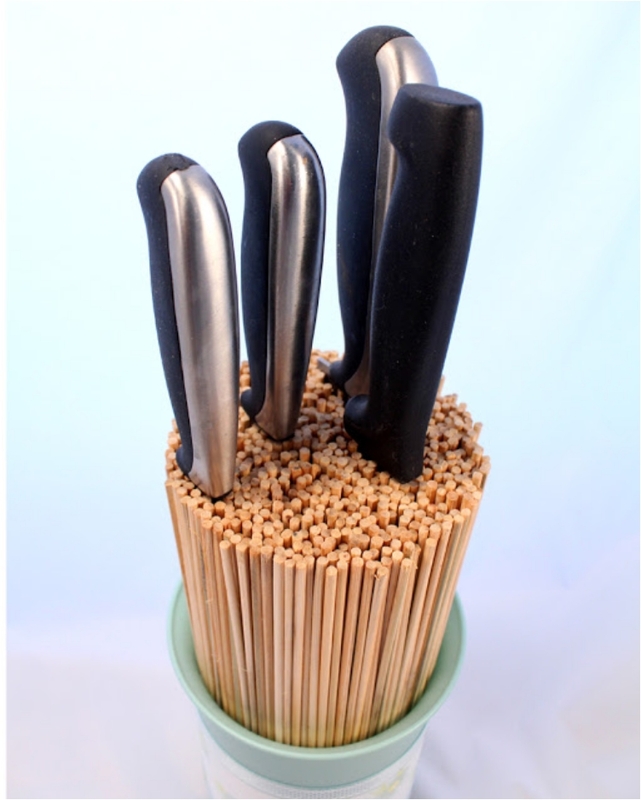 When you store your knives upside down, you are ensuring that you don’t get cut when reaching for one. And speaking of knives and security, I have another way you can take care of them. This time, we keep them safe and secure with magnets. And the inside of the cabinet is very good spot to add magnets. I said before that I don’t drink coffee or tea. But it is important to have some at home. 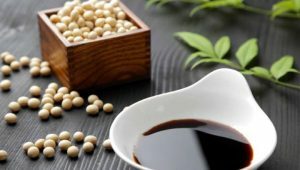 And in the modern era of Nescafe, cappuccino, and other types of coffee, you need more than just two cups. You need a whole set for coffee, parked perfectly in the coffee corner. The same trick can be used for foils. You just need to put them in a more accessible space. But let’s get back to trash bags. I said previously that people don’t want to see your trash cabinet. And they don’t want to see your trash bags either. Keep them hidden from the public’s eye. It’s important to find storage for fruits and vegetables. Not all of us can run to the market on a daily basis and get some fruits and veggies. Most of us go there once a week, and buy fruit in bulk. 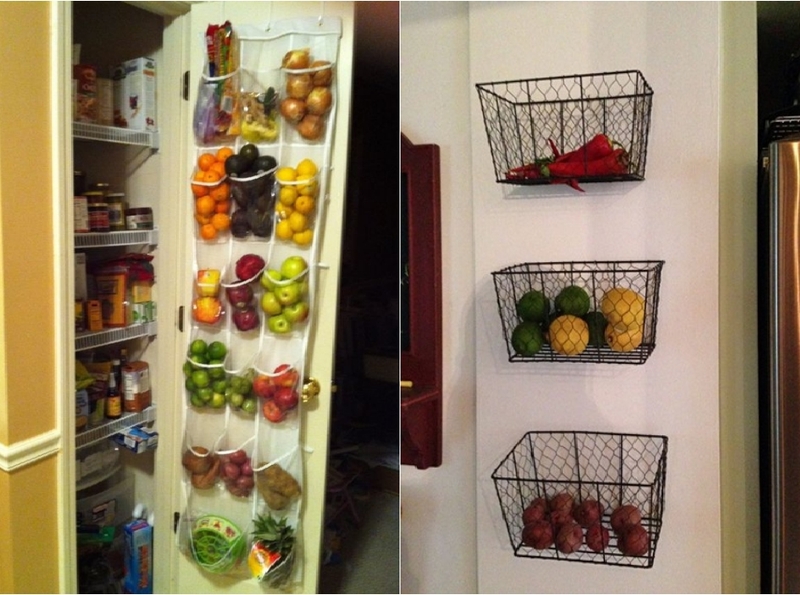 So when you come home, it can be overwhelming to find storage for all those veggies. Not anymore. We talked previously about pots and pans. 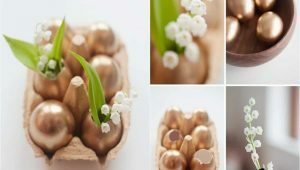 They are one of the most challenging objects in the kitchen to store. 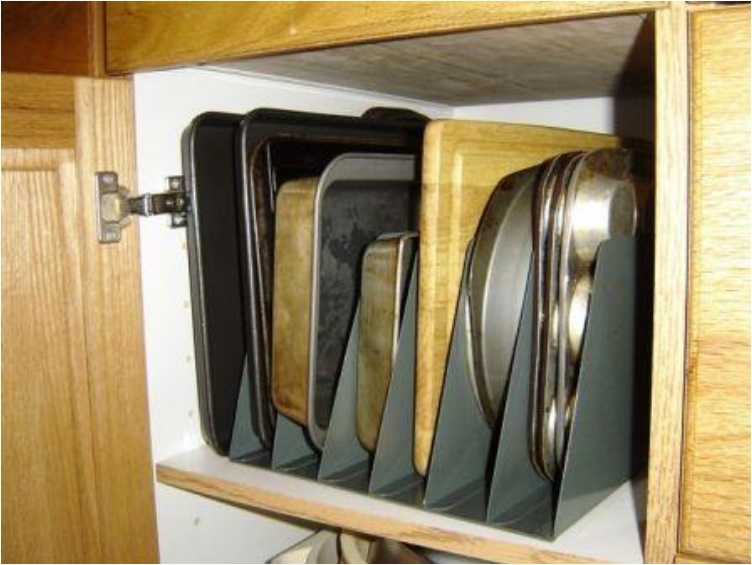 Baking pans and cookie sheets are also bulky and voluminous, and they eat up space. 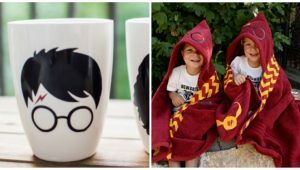 So, you need some clever ways to store them. I love two-in-one products. And I especially love those two-in-one multifunctional furniture pieces. 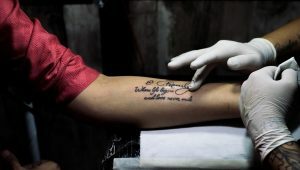 Like this one. 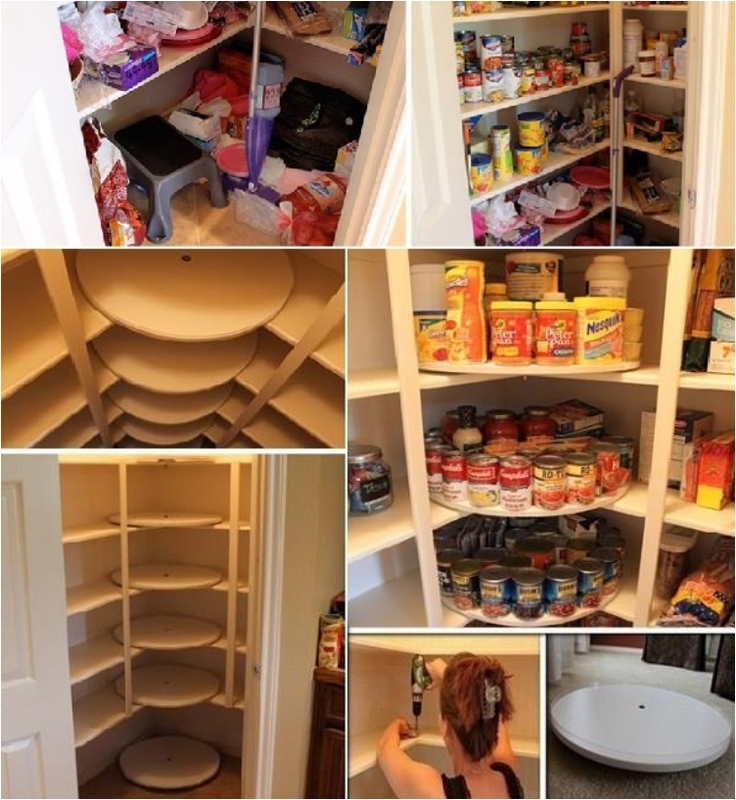 This can be your “store everything” area in the kitchen. And it will save you a ton of space. What more can you ask for? If you cook by following recipes, it can get tricky. Especially when you get to that section that requires one cup, half a cup, or a quarter of a cup. Measuring can be time-consuming and tricky. You wonder if you’ve added enough or not. So, to solve that problem, we have an area for measuring cups and spoons. As you can see by now, the wall is arguably one of the most commonly used ways to increase space. And this is especially true if you have high kitchen ceilings. The higher the wall, the better. 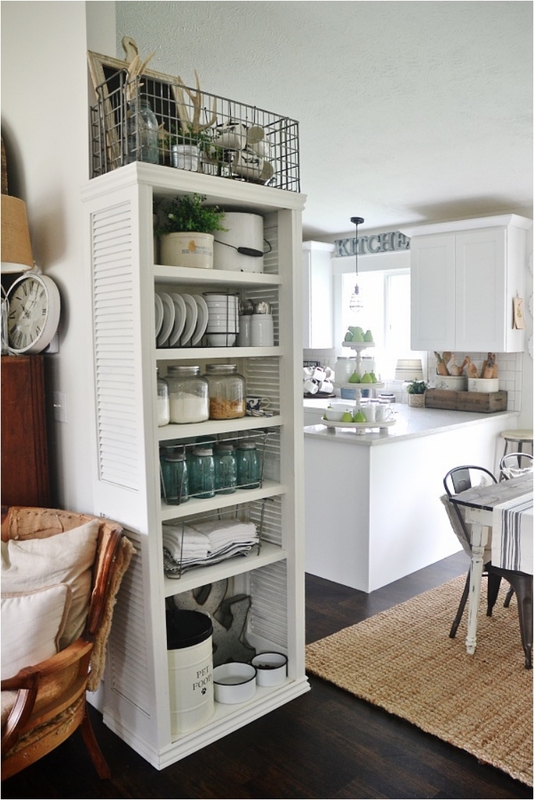 The good thing is that you can hide this jar storage at any time. Just roll it in or out. 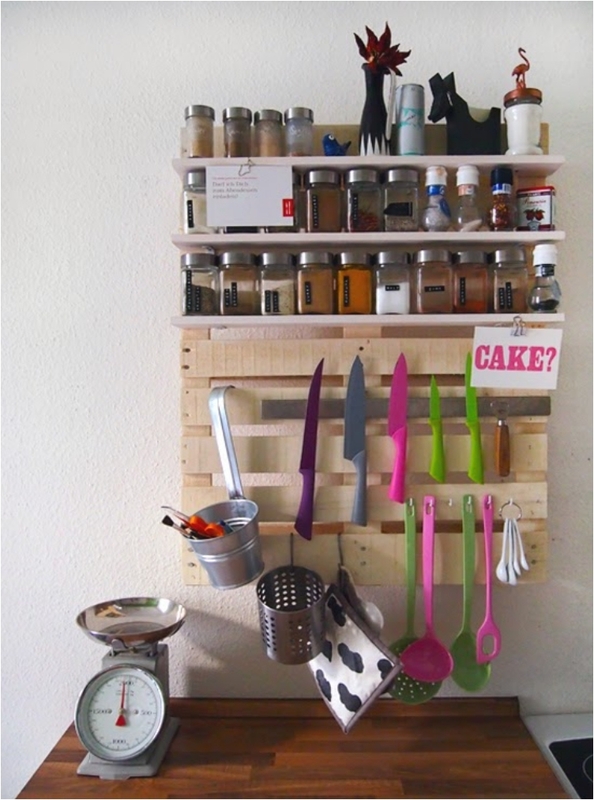 And that makes it practical and versatile for your kitchen. You’ve probably seen this trick in bars and restaurants. This is the way they store all types of glasses. They might not use an old rake, but who says you can’t? 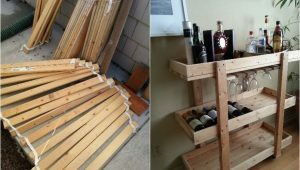 Yes, you can make your own shelves for the kitchen, and it won’t take you more than a few hours to do it. Just try to find a suitable area in the kitchen to place it. We had the wall, and we have the cupboard or cabinet door. 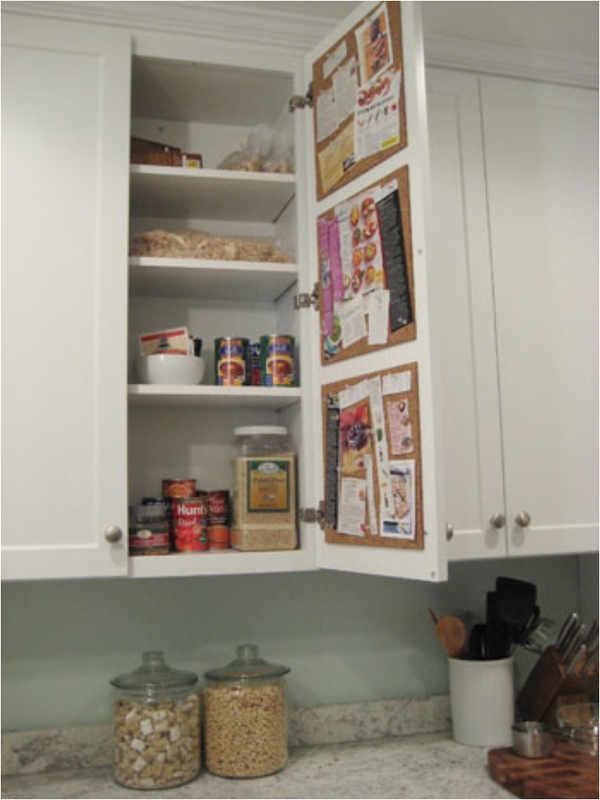 Those are the two most commonly used areas in the kitchen for adding extra space. The cupboard can fit anything you like. It’s just a matter of what you need. 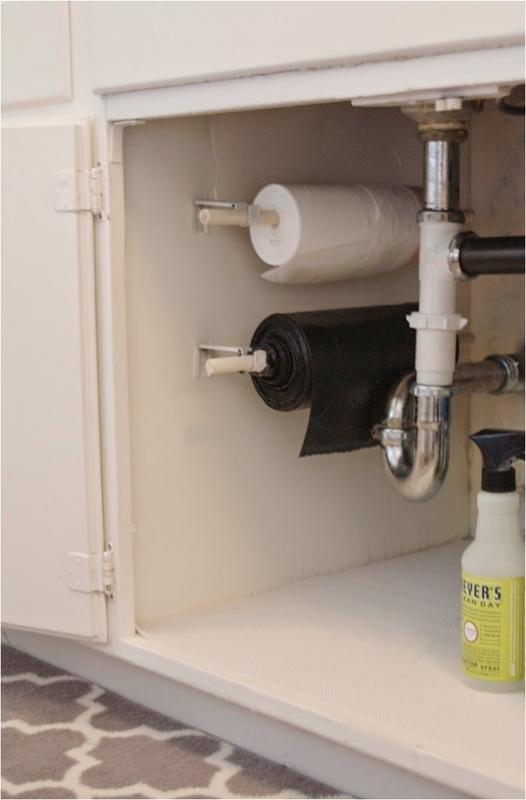 For the last idea, we have one of the most practical uses for the area over the sink. 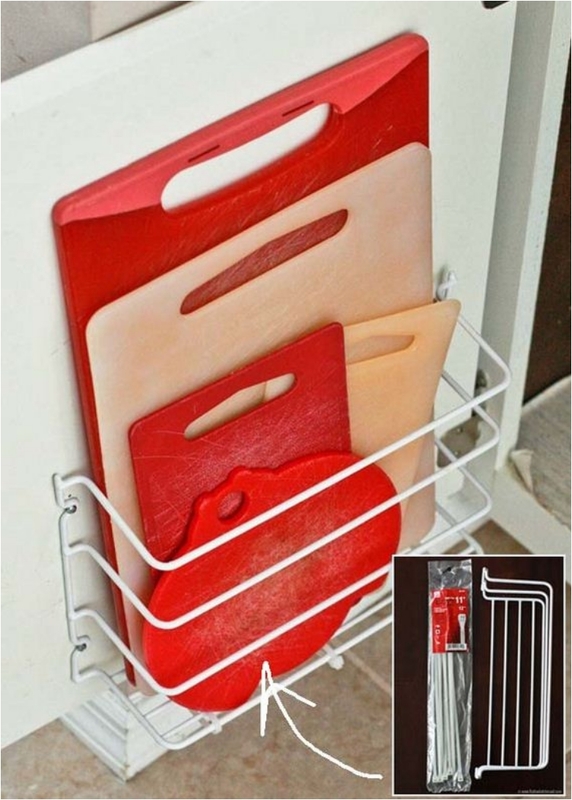 You want to be able to dry your dishes easily. You want something that is with arm’s reach. So, don’t ignore the space over your sink, and you’ll be good. 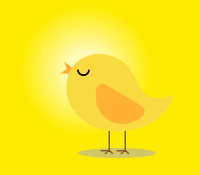 I hope you found something that you can use in your home!